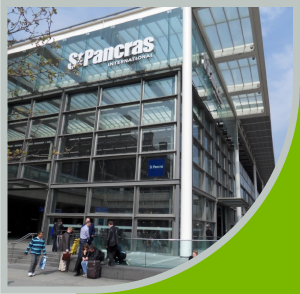 The classic development of the new extension to the old historical station of St. Pancras has created a stunning train terminus to rival any in the world. The marrying of old and new always throws up construction and maintenance issues and Stress UK has for the last few years provided HS1 with solutions to many water ingress problems. 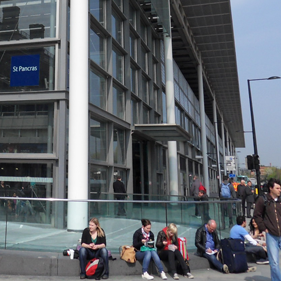 The most interesting problem Stress UK tackled at St Pancras was the ‘key hole pavement window’ allowing light down onto the escalators which link St. Pancras and Kings Cross Stations. 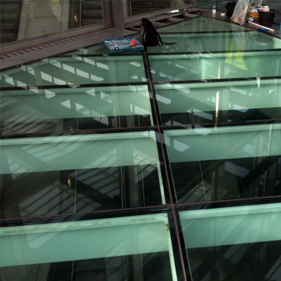 From installation the glazing has leaked and various attempts had been tried by others to prevent water ingress. Stress went back to the original design and carried out on investigation of the construction to find out that a drainage gully outlet was blocked, the shape of the glazing had indefined falls and there were holes in the waterproof membrane. Our team exposed the entire circular gully, thoroughly cleaned the area and re-graded the falls. Finally the application of a new waterproof membrane together with re-sealing of the glazing joints successfully rendered the whole feature water tight and resistant to future damaging water penetration. 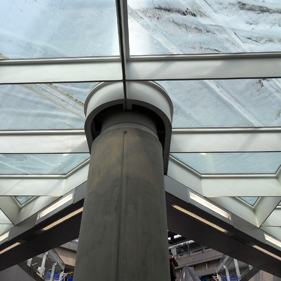 This glass feature was design to flood an otherwise dark, below pavement level, area with light. Unfortunately it had leaked from it’s original installation. Our inspection revealed the original design was causing a drainage gully outlet blockage, directional problems with the falls and a leaking membrane. After extensive cleaning, re-grading of the falls and a new membrane the freshly resealed window was now water tight.